Click to viewApparently scientists (and some of our readers, surely) have known that we can grow oil for years, and not in the grow-corn-make-oil kind of way. The Brazilian Copaifera langsdorfii can be tapped (ala maple syrup) for a natural diesel fuel that requires only simple filtering before being poured into a truck. 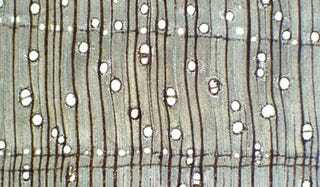 (This picture is of the tree's cells.) The catch? The diesel only has a shelf-life of about 3 months. So how many trees would it take to match the oil output of, say, Saudi Arabia? Check our stats after the jump. Some interesting metrics to think about. On a worldwide scale, it doesn't seem all that impossible to alleviate oil shortages with plants...and the natural carbon offsets seem worthwhile. It's just too bad these trees take 15-20 years to mature (by which time we plan on flying around in a hydrogen Jetsonmobile).